Dr Notley here. Winnipeg Chiropractor and Athletic Therapist. 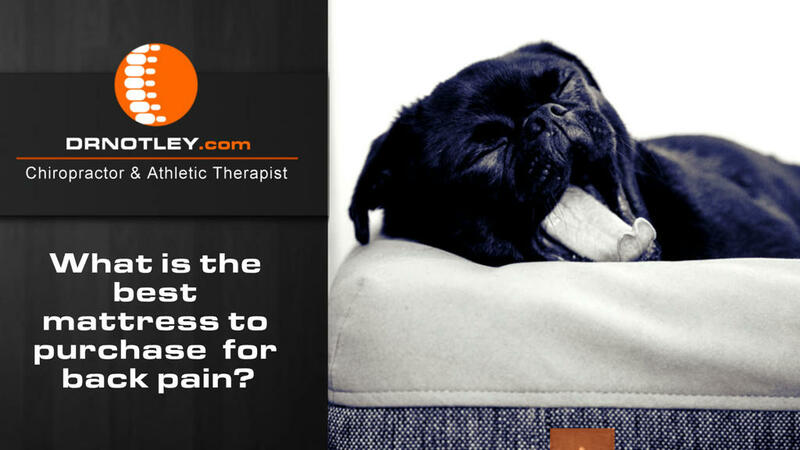 Sometimes the cause of morning back stiffness or chronic lower back pain is the bed you sleep in. What is the best type of mattress? Research has looked at the affect of changing mattress types on the quality of sleep as well as the affect on lower back pain. Lower back pain is more prominent in those who use cheaper mattresses. Despite similar quality mattresses the amount of spinal twisting or bending in the thoracic spine varies significantly. Foam or innerspring mattress? It doesn’t matter. The quality of sleep is unaffected. Adjustable air beds and custom bedding systems reduce back pain and improve sleep quality. Using a mattress of medium firmness improves pain, disability and sleep quality. But there is some question whether this is true for heavier individuals. At this point in time it seems that a mattress of medium firmness and of medium or high quality material may be best but there will be some variation in comfort depending on the individual. A customized mattress may be the best option but likely the most expensive.